If you can pay for a 95¢ pack of gum with your credit card, then you should be able to use your card for that antique mahogany desk at the craft fair! The new smartphone card readers, aside from looking super cool, are also highly functional. Being able to accept credit cards anywhere at any time, regardless of whether you have a brick and mortar store, or are a local artist, can dramatically increase your sales and streamline your invoice process as well. While there are probably around a hundred card processing apps available for different smartphones (iPhones win out here), only a small number of companies have joined an app to a specific card swiping device. See how they all compare before you decide which one is best for your business. Perhaps the smallest card reader on the market, Square is also one of the most easily recognizable devices. About the size of a book of matches, Square plugs directly into the audio jack and can be used on most iPhones or Android phones. Both the device and app are free, and no contract or merchant account is required, so money goes straight into your bank account. It looks sleek, is easy to use, and allows you to make refunds easily. Square’s pricing plan is equally as simple. 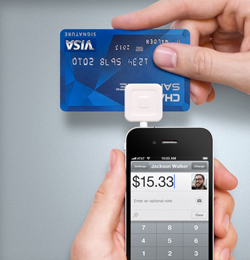 For every card swipe, Square takes 2.75%. However, non-swipe transactions incur a fee of 3.5% plus 15¢. There are tons of other non-swipe card processing apps for the iPhone. Some of these are: Pocket Terminal (can handle multiple business accounts), iPay POS (compatible with dozens of the most popular payment gateways), ProcessAway (recurring billing), SWIPE (cheap app with lots of features), and many more. 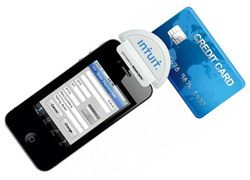 Intuit GoPayment is similar to Square but with two distinct differences. While Square only works with Apple and Android products, Intuit GoPayment is also compatible with BlackBerry devices (Note: only the app, not the card swiper). This service also gives larger businesses the option of signing up for a $13 monthly plan with reduced transaction fees of 1.7% (swiped) and 2.7% (non-swiped). The app and card reader are free, and money is deposited right into your bank account. Made by VeriFone, one of the leading developers of electronic payment systems, PAYware Mobile is one of the few card processing apps that will soon have international capabilities covering Canada and the UK. PAYware Mobile, like many other apps, can integrate itself to your already existing merchant account, and allows you to track your transactions geographically. The upgraded series, PAYware Mobile Enterprise, delivers multiple card processing devices that have a PIN pad and a bar code scanner. Now you can have multiple POSs and inventory management stations that can all be managed remotely. 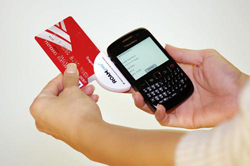 ROAMpay is especially unique because it is most likely the only service that offers an app-card swiper combination for the iPhone, Android, and BlackBerry. The app itself is compatible with a surprisingly wide range of mobile phones, including many flip phones. Pricing varies depending on your business, and you need to be a ROAMpay member to get exact figures. WARNING: Before you go showing off your fancy new card swiper, there is (at least) one more thing to think about. Imagine you were buying a diamond ring, and the seller behind the counter pulled out his Iron Man-personalized iPhone to process your $3,500 purchase. How would you feel about that? Would you feel a bit nervous? Would you prefer the traditional cash register method? Making card transactions easier (and chicer) isn’t an excuse to ignore customers’ joys and hesitations. Consumer fears about security are very real, especially when it comes to personal information and privacy. 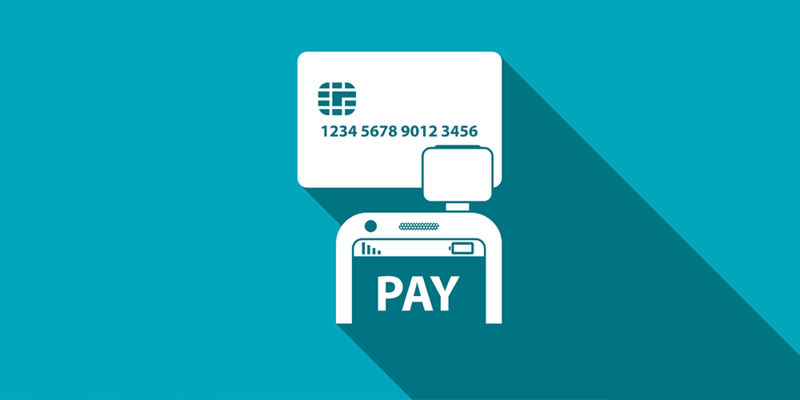 While making card transactions easier and more efficient is good business for everybody, consumers (and sellers) still need to know that their data is safe as well.